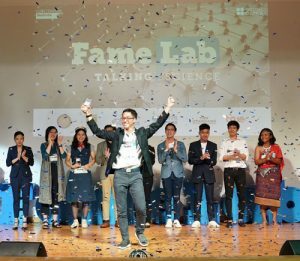 Mr. Apivich Hemachandra, a student majoring in Physics at Mahidol University International College (MUIC), won FameLab Thailand Competition 2018, a science communication competition wherein the contestants have to explain clearly and effectively a scientific concept to a general audience in just 3 minutes. Organized by the British Council of Thailand, the national competition was held at the Bangkok Art & Culture Centre (BACC) on April 28, 2018. As the national winner, Mr. Apivich will compete in June 2018 in the International FameLab Competition at Cheltenham Science Festival, United Kingdom accompanied by Ms. Cherprang Areekul, a Chemistry student from MUIC and also team captain of popular idol group BNK48. This international contest is indeed a rare opportunity for science students to demonstrate their knowledge and skills.